Presentation Ideas Don’t Carry the Burden Alone! This article will detail a few simple tasks that you should do AFTER the Presentation… unfortunately most groups don’t do any, let alone just one, of these! Be sure to CC this thank you to the Presenter’s boss, Personal Assistant and any other people they had CC’ed in emails. If there were any questions arising from the meeting, send them through as a seperate email — this way the Thank You isn’t lost amongst the questions. A rather novel approach to thanking a Guest Presenter is to send them a postcard! These days most of your members will have an iPhone or other device with a built-in camera, or you may be be lucky enough to have a member with a good professional level digital camera. 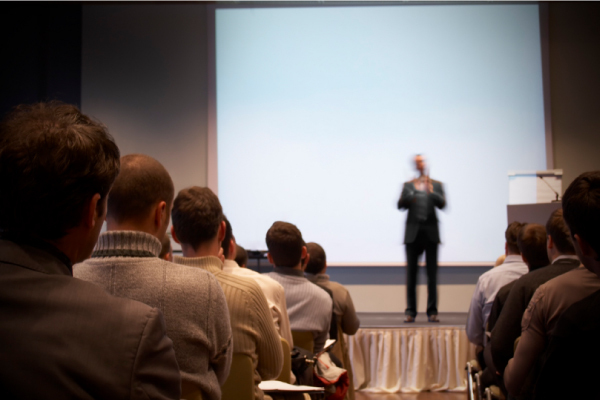 Have someone dedicated at each meeting to grab a few photos of the presentation and be sure to capture a few with the Guest Presenter — either standing in front of a clearly identifiable slide from their presentation or them shaking hands at the end of the presentation. There are dozens of Apps on the iTune Store that lets you upload one of your photos and then create a postcard that is then sent via snail mail. Add a watermark of your Group’s logo to the image. Launch the Postcard App of your choice. Include your own personal message, up to 10 lines long, printed featuring a handwritten font. Postcards are printed on 16cm x 10.6cm high-quality card, with a glossy finish to ensure your image is vibrant and doesn’t fade. Fast, safe delivery with Australia Post. With in 24 hours of the presentation occurring, and ideally before you send the thank you email, have a brief summary of the presentation posted to your website. This can be a simple sentence just listing the topic and presenter and hopefully a link back to the Guest Presenter’s website. * Get the Guest Presenters permission BEFORE doing this. When reporting on the meeting contents, you don’t need reams of information. Just a few paragraphs is usually sufficient. After all you want people to come to the actual presentation, and future ones. If they know they can get ALL the information from your website afterwards they may not bother attending the presentation itself. A bonus of these Past Meeting pages is you can use them to highlight to future potential Guest Presenters the types of presentations your group has hosted in the past and why your meeting is an ideal forum for the Guest Presenter to present their information. At the end of the year, or just prior to your Annual General Meeting, send short personalised greeting card to the Presenter… especially to those who presented a lot earlier in the year. These cards can be a physical card or an e-card – it all depends on your budget. Packs of paper cards, with either a Holiday Season tone or just a simple “Thank You” theme can often be purchased for a few dollars for a pack of ten cards with envelopes from “$2 shops” and there are dozens upon dozens of free or inexpensive templates with these themes in mind, available for Apple Mail or as standalone apps. In this card simply thank the Presenter for their “support during the year” on behalf of your club. This is also why many organisations that hold Annual General Meetings where they elect a new Committee (even if all members are re-elected unopposed) will often use this period as a time to send Thank You cards to all the people who have assisted them during their past term, including Guest Presenters. In fact, they can be more appreciated arriving out of the blue rather than been lost amongst all the other Holiday Season cards. Many User Groups maintain a email announcement list for upcoming meetings. Consider asking the presenter if they would like to be included on future announcements. Only consider doing this IF you have a low volume Announcement-Only list — i.e. only one or two messages a month. Do NOT add them to a general discussion list! If a Guest Presenter was popular, don’t hesitate to contact them again and ask if they’d be interested in giving another presentation. This could be an extension on what they have already presented or it could be for a totally new topic. Go back to the basics when approaching the presenter again. But in your new approach letter you can now say that your members really enjoyed the previous presentation and they would love to see the presenter return. Invite them to your party! Many User Groups have an “End of Year” celebration as their December meeting. Sometimes this is just an informal ordering in of pizza and soft drink to the regular monthly meeting and all members present can join in. Others have a special event, usually at a local restaurant, to thank the various helpers and volunteers from during the year. If you hold either such event, seriously consider inviting back your past Presenters as an additional thank you. And perhaps consider inviting their partner or their boss and personal assistant too?? ?